The matching cassette recorder for the Beomaster 2000 and 3000, which replaced Beocord 2400. The use of the new Vortex tape transport, first seen in the Beocord 5000, allowed the Beocord 2000 to be much slimmer than its predecessor, so now it looked “right” when placed alongside the Beomaster. Another piece of progress was that the new mechanism could be electronically controlled, so the previous mechanical keys could now be replaced with touch pads, identical to those on the Beomaster. This also made Datalink a practical addition, which brought with it remote control, when used with Beomaster 3000. To complete the re-style of the front panel, a single LED recording level display replaced the twin meters of the 2400, though this was not new, it had been seen before on the Beocord 1700, a model which the Beocord 2400 had replaced! A surprising feature was the manual tape selector, which took the form of a slide switch under the top cover. The Beocord 5000, which used an almost identical mechanism, had fully automatic tape selection, so it was clearly possible. There was also no tape detection switch, also unlike the Beocord 5000, so the machine would engage regardless of whether a cassette was loaded. 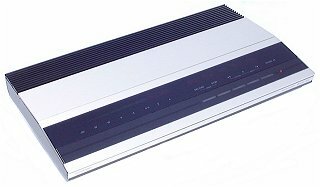 The Beocord 2000 was the last Beocord model not to include HX Pro noise reduction, and offered similar performance to the cassette section of a Beocenter, such as the 7000. Text copyright © Beocentral. Unauthorised reproduction prohibited.